’’For God all things are possible’’ is our theme for the conference. We are living in changing and exciting times. In Sweden we have seen a major change and people are responding to the Gospel. We have the honor to have Pastor Thomas Schaller from Greater Grace Church in Baltimore as our guest speaker. 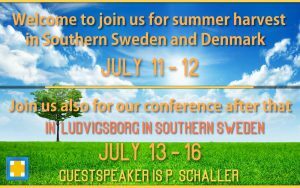 Pastor Schaller will even join us during our outreach in Copenhagen as we reach out to our neighboring country with the Gospel of Grace a few days. Ludvigsborg lies in the middle of Skåne in southern Sweden in beautiful nature and that is where we have our main church. We will start the week reaching out in Copenhagen on the 11th and 12th with evangelism, sketch board, music, and meetings. On the morning of the 13th we will continue on to Ludvigsborg with a stop in Malmö för evangelism and lunch. Then after that onwards to Ludvigsborg and the conference. Ludvigsborg is about 45 minutes by car, bus or train from Malmö. The first meeting of the conference is in the evening of the 13th. Why not combine this harvest time in Copenhagen with the conference in Ludvigsborg. Accommodations (except 4, 5 och 6) are by the lake Ringsjön and have possibilities for swimming. The conference fee is 300 skr for adults and 90 skr for children under 13. One day passes are 100 skr for adults and 30 skr for children under 13. Breakfasts are provided at the hotels. Lunches during Friday and Saturday will be eaten in the outreach area and not included. We will prepare three dinners Thursday, Friday, and Saturday and one lunch on Sunday at a cost of 40 skr per meal. Coffee and snacks during rap sessions are provided at 10 skr. We look forward to a wonderful time together in beautiful nature and in great fellowship in the Body of Christ and in the Word of God. Come and be blessed and to bless. For more information and registration contact Magnus Gustavsson.